Showers this morning then thundershowers developing during the afternoon hours. High 66F. ESE winds shifting to W at 10 to 15 mph. Chance of rain 90%. 1 to 2 inches of rain expected..
Chuck Stuhrenberg, owner of Big Muddy Brewery in Murphysboro, mixes up a batch of the brewery’s flagship beer in August 2015. ABOVE: Taps are seen at Little Egypt Brewery in Ava in March 2015. Chuck Stuhrenberg, owner of Big Muddy Brewery in Murphysboro, is pictured in the brewpub in August 2015. CARBONDALE — The ability of breweries to self-distribute their own products was the key that unlocked an industry in Southern Illinois that had most likely been underserved, according to brewers in Southern Illinois. In June 2011, former Illinois Gov. Pat Quinn signed Senate Bill 754 creating a craft brewer license, and an exemption to self-distribute 7,500 barrels if a brewery manufactured no more than 15,000 barrels. That number has been increased to 30,000 barrels a year in 2013, and then increased again in 2015 when Gov. Bruce Rauner signed a bill allowing breweries to make up to 120,000 barrels of beer per year. The bill also allowed a brewpub to simultaneously own a craft brewer’s license. Chuck Stuhrenberg, owner of Big Muddy Brewing in Murphysboro, said he was the first production brewery south of Chicago since Prohibition. He is distributing beer throughout the United States. Stuhrenberg was the first, but soon a line of breweries followed him and now there are six breweries just in Jackson County — a fact that Stuhrenberg likes to point out, saying there are only about 60,000 people in the county, but there are six breweries, meaning the county has one of the highest breweries per capita in the state. ELKVILLE — Chris Harris has found a way to combine his love for beer and music into one facility. Little Egypt Beer, Scratch Brewing Co., Von Jakob Brewery, Abbey Ridge, Big Muddy and Route 51 Brewing — which is under construction now — are all in Jackson County. St. Nicholas Brewing Co. calls Du Quoin home in Perry County, and The White Rooster Farmhouse Brewery is under construction in Sparta. Stuhrenberg said Southern Illinois already has many more wineries and it was only a matter of time before breweries started to catch up. He said several of his customers on the weekends are people from outside the area, who Big Muddy sends onto other breweries or wineries in the region. 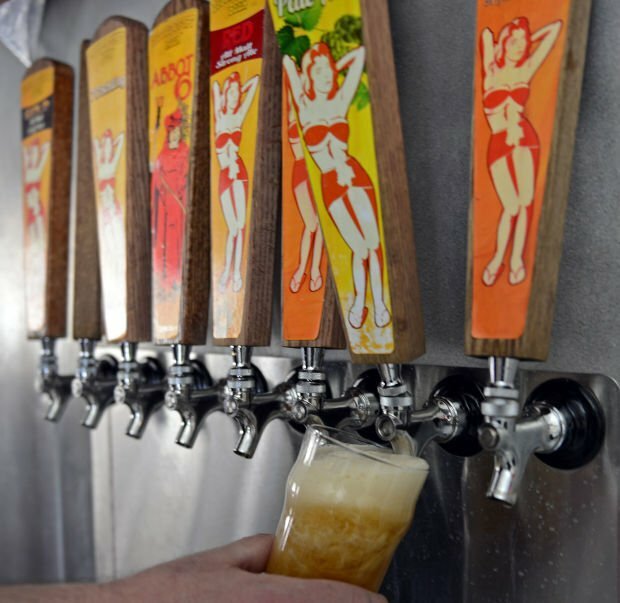 Ken Rhude, owner of Little Egypt, said the expansion of craft breweries is a result of the marketplace being underserved and the region being late to the craft beer party. Now, he said, the market in Southern Illinois is becoming more and more refined, meaning the consumer’s expectations of quality beer is higher. “New operators need to be making great beer or they are going to struggle,” he said. Rhude is finishing a business plan for a nearly 11,500 square foot brewpub at Reed Station Road and Old Illinois 13 in Carbondale. The Brewer’s Association, a trade association representing small and independent craft brewers, released 2015 data on the U.S. craft beer industry growth on March 22. “With more breweries than ever before, small and independent craft brewers now represent 12 percent of the market share of the overall beer industry,” the associated said in a news release. The boom of craft beer isn’t just felt by those in the industry, but restaurants and liquor stores have noticed the changes and have made adjustments. T.J. Martin, co-owner of Underground Barrel Room and Grill, said it is an ever-growing segment of the market. He said the restaurant had dedicated more than half of its draft beer selection to different styles of craft beer, which is limited to 12 taps. Martin said there are always going to be the customers that will drink the traditional domestic beers, but about 50 to 60 percent of his beer sales come from craft style. According to Underground’s menu online, there are 65 beers available with the majority being craft selections. Dustin Rochkes, manager at the Warehouse Liquor Mart, said the sales for craft products grows with each passing day. He said the amount of craft beer sales has started to eat into the amount of domestic beer cases he orders. He said craft beer isn’t the only reason, but it has contributed. Business and southern side of the region. The prospects are done for the research paper service to be conducted and floated. The research is done for the perpetual times of the southern sphere of the acute and reflected.